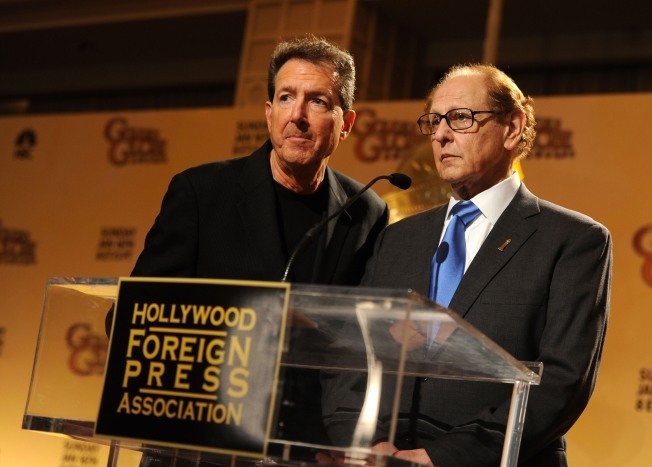 Executive producer Barry Adelman and Hollywood Foreign Press Association president Philip Berk speak onstage during the 68th Annual Golden Globe Awards nomination announcement held at the Beverly Hilton Hotel on December 14, 2010 in Beverly Hills, California. A former publicist for the organization that runs the Golden Globes sued the group on the eve of its glitzy awards show, claiming it engages in payola schemes for nominations and awards. Michael Russell sued the Hollywood Foreign Press Association late Thursday, just three days before the Golden Globes are slated to air Sunday on NBC. The lawsuit claims that many association members "abuse their positions and engage in unethical and potentially unlawful deals and arrangements which amount to a 'payola' scheme" that could be illegal and jeopardize the group's tax-exempt status. In addition, the suit alleges the association sells prime spots on the show's red carpet to lesser-known media outlets. The filing does not list any specific examples in which a studio or producer has paid for a Golden Globes nomination or award. A statement from Ken Sunshine, whose company currently handles the show's public relations, said the allegations were without merit. "This is no more than the case of a disgruntled former consulting firm, whose contract was not renewed, attempting to take advantage once again of the Globe's international stage for their own gain," the statment reads. The lawsuit seeks million and alleges breach of contract, defamation and fraud over the association's firing of Russell and his partner after the awards show last year. The complaint states the pair were dismissed after a dispute with association President Philip Berk over a charity and advertising campaign with Chrysler. The pair frequently tried to raise the issue of ethical and potentially unlawful activity to Berk, the complaint states, but the claims were ignored. A phone message and e-mail to Golden Globes publicist Michael Samonte was not immediately returned Friday. An e-mail to Globes publicist Keleigh Thomas was also not immediately returned. Although the show is a precursor to the Academy Awards, it has long been criticized for some of its nominations, which are perceived as a way to gain favor with top actors. This year's show has been no different, with criticism of acting nominations for Johnny Depp and Angelina Jolie for "The Tourist," a critical and commercial flop. Russell's lawsuit notes a previous controversy that cast the Globes into obscurity for more than a decade. In the early 1980s, the Globes lost its broadcast deal with CBS after it was accused of receiving favors in exchange for giving actress Pia Zadora a newcomer award. The Golden Globes have been broadcast on NBC since 1995. The lawsuit says the network has paid million a year for the broadcast rights in a deal that expires after Sunday's show. The lawsuit claims a renewed license fee could jump to million a year. A phone message for Russell's attorney, Timothy McGonigle, seeking more details was not immediately returned.